The new Kilmarnock Town Centre Park is undoubtedly a hit with the locals. Kids adore the splash pad. Adults love the live music at the Half Shell amphitheater. Canines dig the dog park. The park has a perfect 5-star rating on Facebook. Yosemite gets a 4.9. But I know someone who might like it even more than the good people of Kilmarnock: Mother Earth. The bugs are buzzing about the native perennials in the pollinator garden. The nearby streams swell with pride–not stormwater–at the runoff-reducing pervious pavers in the parking lot. The park’s bioretentions channel rainwater into groundwater, making the Northern Neck’s aquifer a little fuller and a little happier every time it rains. Kilmarnock Town Center Park. Photo courtesy of the Rappahannock Record. And Mother Earth always pays you back. The bugs go next door and help pollinate local farmers’ crops. Every drop of stormwater that enters earth’s natural Brita filter (the ground) instead of a storm drain helps refill the Chesapeake Bay with clean water. A cleaner bay means our watermen bring in bigger, healthier harvests, which might knock a few cents off your crabcake. And all that rainwater infiltration makes the well water downhill of Kilmarnock taste a little sweeter. Engineers call these sorts of environmentally-friendly landscaping devices green infrastructure. At F.O.R., we call them common sense. Kilmarnock Town Centre Park is square with Mother Earth. 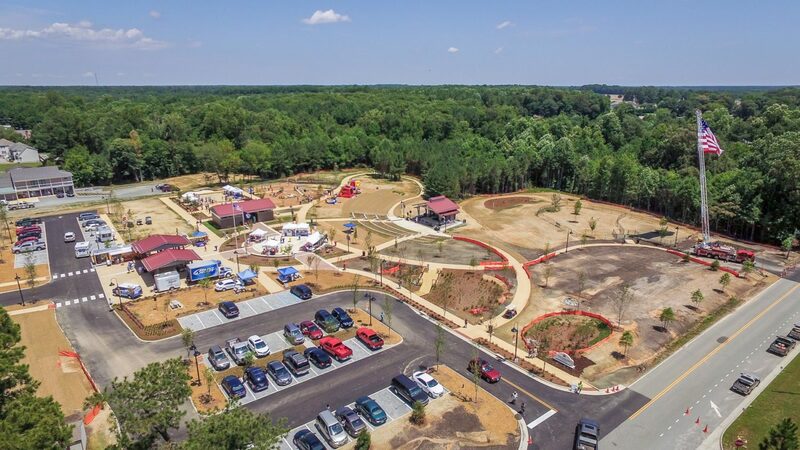 That’s why it gets our stamp of approval as a model for greener parks in the Northern Neck and beyond.